Cool video by the artist dou_ble_you (Andrew Stys) using my song “Communique” for the soundtrack. Old Songs from Patrick O'Neil on Vimeo. 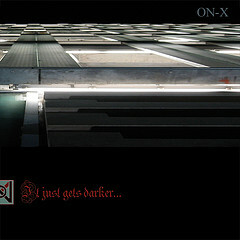 ON-X: It Just Gets Darker… A five-song EP/CD, written, composed, performed, and recorded by Patrick O’Neil, in collaboration with guitarist Stephen Salit in 2008. Long time coming. That train, at first a faint dot on the horizon. Now a locomotive running full throttle through your brain. Seemed like we’d been on those tracks forever. One station after another, the blur of familiarity turning into boredom, the landscape, flat-lined like a dead man’s pulse. Got a guitar chord that’s burning a hole in our pockets. Couldn’t cash it out, or string it along with another couple a notes to make the melody. Damn bass line so loud you’d have thought we’d fumbled a knob or two. Spliced and elctro-fed the drummer until he bled. Intravenous keyboards. High gelded backup singers. Nothing we could do but write a song or two and hold on. Patrick and Stephan met in rehab. One on the lam, two minutes away from nodding out for the last time. The other: flitting through, clutching a guitar, a spastic rhythm still syncopating the electrostatic of his brain. They had no idea there was any future in it. Each one felt like life had ended and another begun. All the signs said they were supposed to do something. Thought they meant something else and ignored the obvious. Now it’s come too far to ignore. 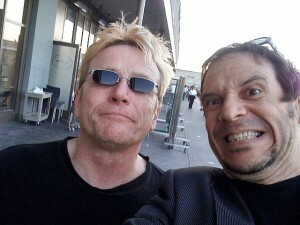 Patrick O’Neil: Bass, vox, keyboards, Lyrics, and Stuff. Stephan:X: Guitar, Vox, keyboards, Music, and Things.